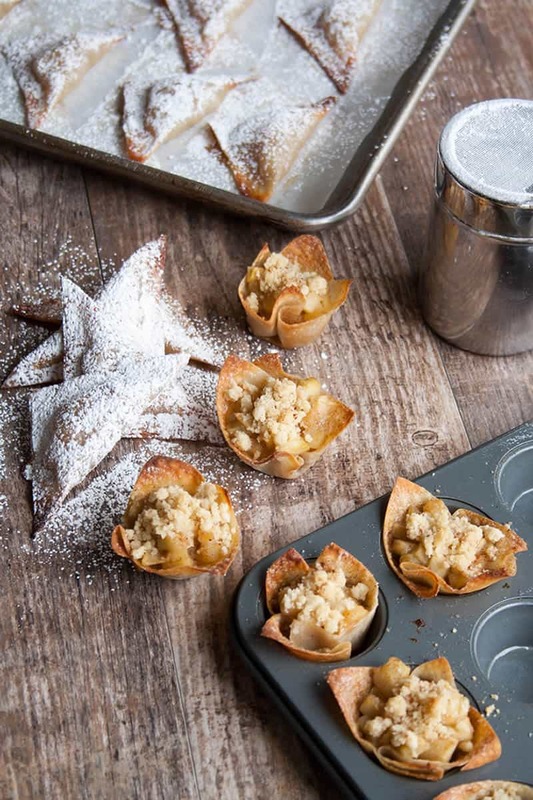 and I’ve always wanted to try using them as vehicle for dessert, so I decided to make Skinny Apple Pie Won Tons. 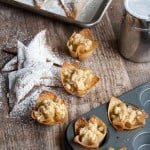 I didn’t exactly plan for them to be of the apple pie variety, but I had the won tons and I had some apples… The rest of the ingredients were basic items like butter, sugar, flour and cinnamon, so Skinny Apple Pie Won Tons were a no brainer. And there’s a bonus! 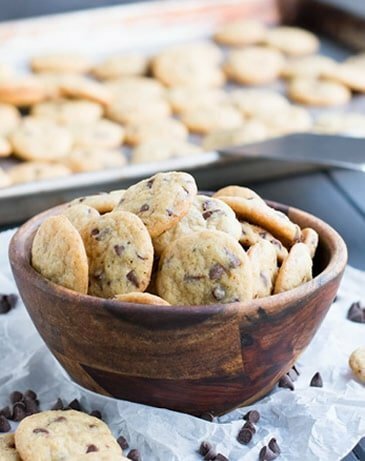 I’m giving you TWO ways to make this guilt free skinny treat! One way has about 63 calories each, the other has about 37 calories. Then I filled them with some apple pie filling I had made a bit earlier. 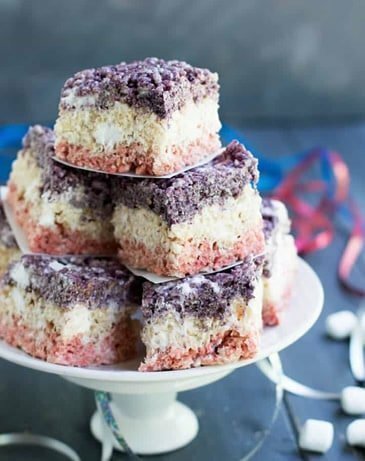 Fruit fillings are quite easy to make. 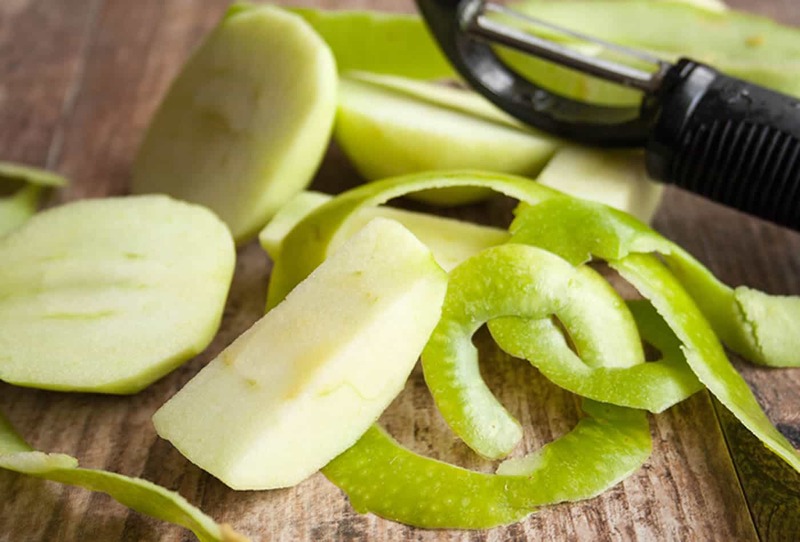 The hardest part is just peeling and chopping up the apple, which doesn’t take too long at all, (especially if you’ve got a good peeler and you pass the time quickly by trying to peel each apple in one long strip.) I chopped them up smaller than I would for a full sized pie because I wanted lots of little chunks to fit into my mini won ton cups. After chopping, there’s just a few minutes cooking on the stove with a handful of ingredients until the mixture thickens. Then you’re done. Just set it aside to cool. I spooned the filling into the partially baked crust, then felt they were a bit bare with the filling exposed, so I made a little crumb topping. In a regular sized apple pie, I actually prefer a crumb topping to another layer of crust. And crumb coffee cake? Yum! Crumb topping makes everything better. They go back in the oven to bake for a short time, and what comes out are the cutest little treats! Each one has its own personality based on how the won ton was pleated into each cup. Even though they looked amazing, I thought I should try another version as a back up, just in case. I had extra filling so I proceeded with some tiny turnovers. These were a even easier than the little pies. I placed small spoonful of filling in the center of the wrapper, wet two edges with water, then folded the wrapper in half, creating a triangle. I sprayed them with a quick shot of cooking spray, sprinkled them with cinnamon sugar, then popped them into the oven until they were a light golden brown. Once they were out of the oven, I gave them a good shower of confectioner’s sugar and they were ready for prime time. Time for a taste test. Which one would be better? Turns out, they were both really good! The little pies took the lead because they were a bit more satisfying. Lots of apple filling in that bite…and the crumb topping? That was a really good idea and made for a more complete little pie. The mini turnovers were also good. They were a bit less sweet (no crumb topping) and a lighter bite as they had less filling than the cups. (They were gobbled up just the same by my family.) 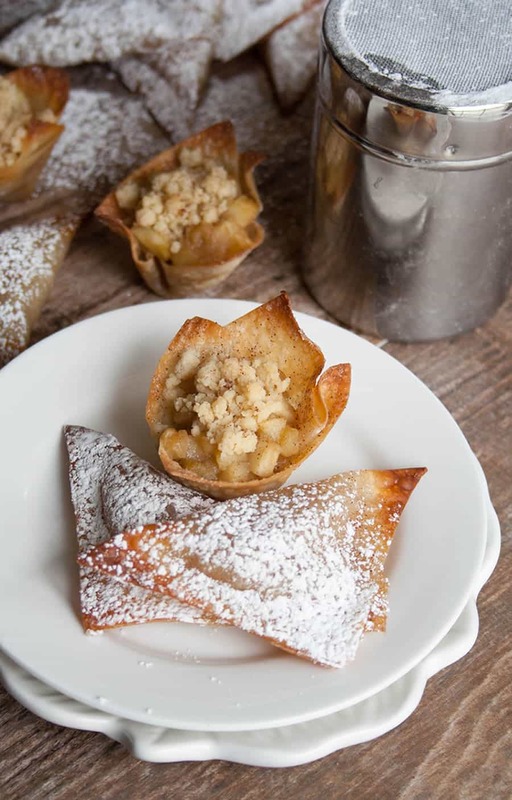 Both qualify nicely as Skinny Apple Pie Won Tons because the apple pie cup calculates to about 63 calories each and the mini turnover, about 31. 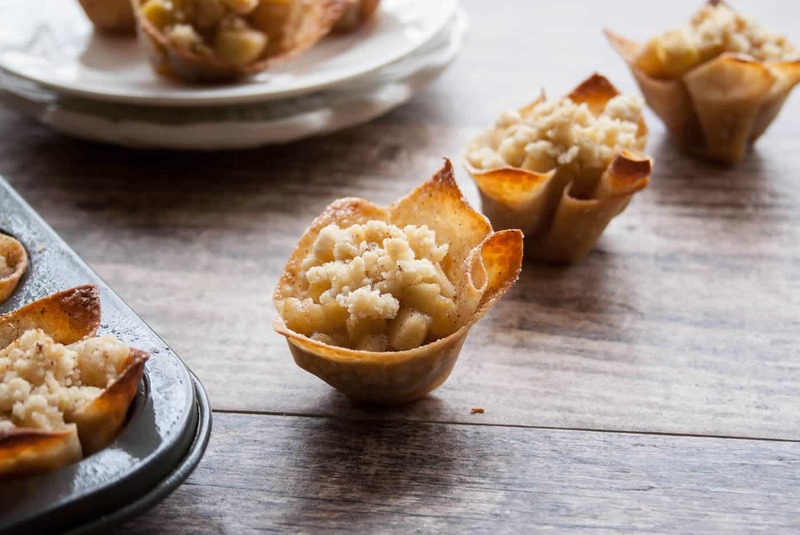 The mini apple pie cup includes the calories for all of the butter that’s brushed on, even if you don’t use it all, so it could actually be less. Either way, they’re a fun little treat when you don’t want to break the calorie bank. There will be plenty of opportunity for splurging in the future. 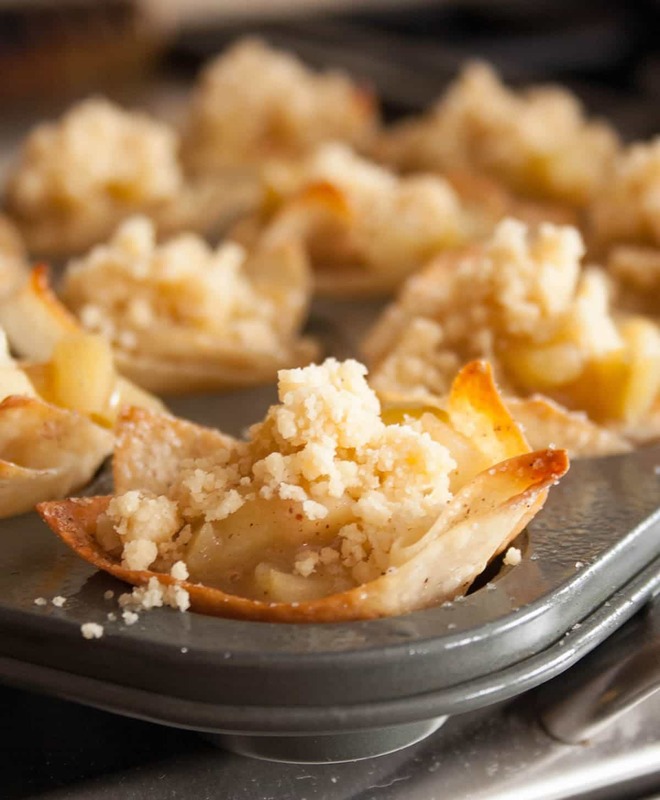 Preheat oven to 350 degrees F. For apple pie cups, spray mini muffin pans with cooking spray. 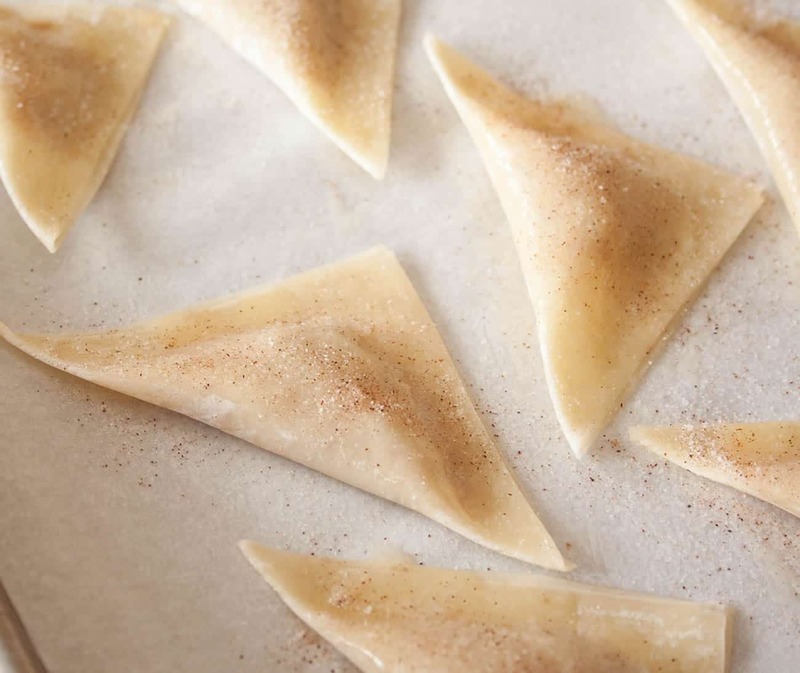 For mini turnovers, spray baking sheets with cooking spray. Make apple pie filling. 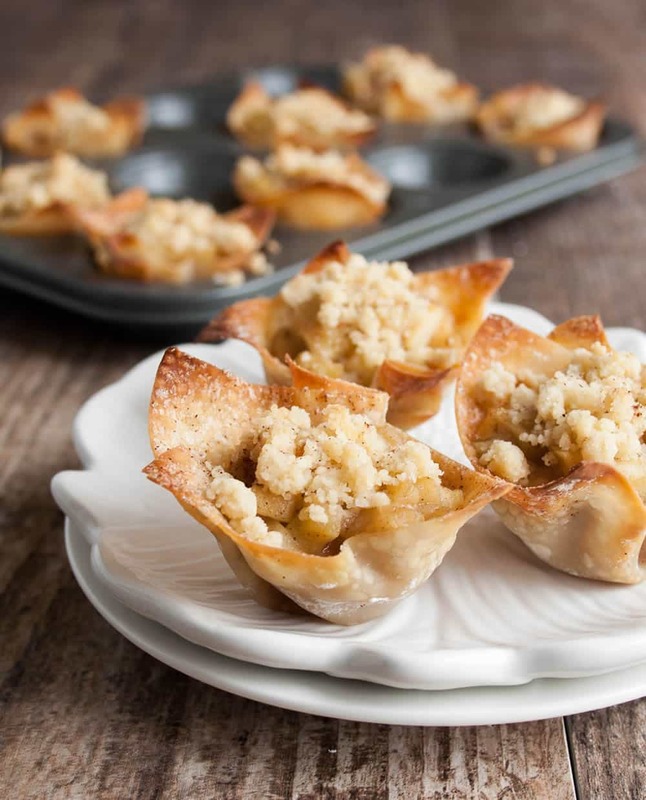 Combine all ingredients for the filling (apples through water) in a sauce pan. Cook over medium heat until bubbly and thickened. Remove from heat and place in a heat safe bowl to continue cooling. Set aside. 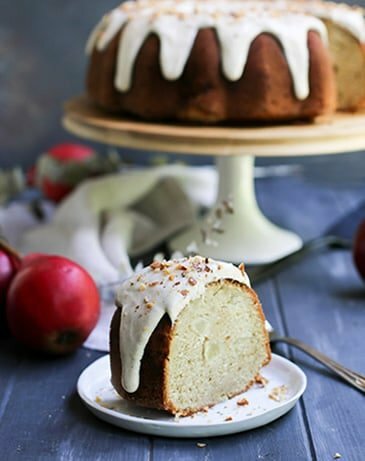 Mix the 2 Tablespoons of sugar and 1/2 teaspoon of cinnamon together in a small bowl and set aside. 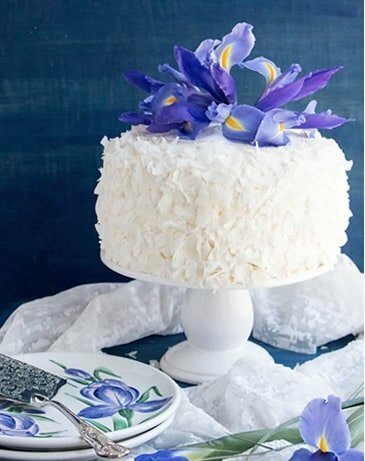 Make the crumb topping by stirring the melted butter, flour, brown sugar until it comes together and starts to form small crumbs. I also added a pinch of salt because I used unsalted butter. This is not necessary if your butter is salted. Brush each wrapper very lightly with melted butter. If you over butter, you'll end up with soggy bottoms. Sprinkle with cinnamon sugar mixture. Place the wrapper gently into the prepared mini muffin cup. I found it was easiest to do this if I pleated the edges while I was placing it in the cup. Just be careful not to tear the wrapper. 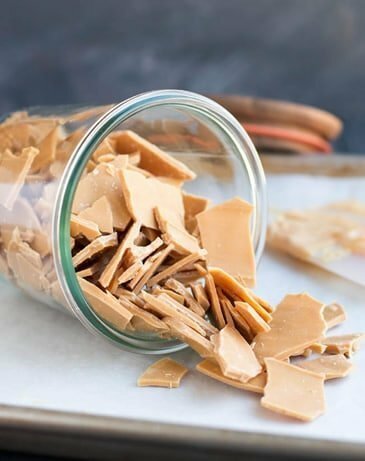 Bake the unfilled wrappers for about 5-7 minutes or until the edges are beginning to brown and butter is bubbly in the cup. Don't worry if a bit of melted butter collects in the bottom of the cups. 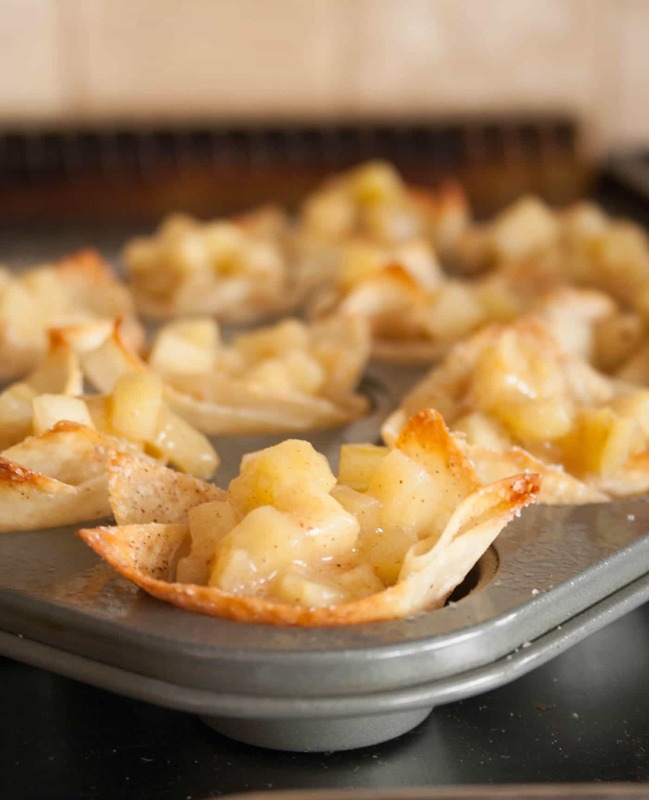 Remove from oven and fill each cup with about a Tablespoon of apple filling. Top with 1/2 teaspoon of crumb topping. Sprinkle topping lightly with cinnamon. Bake for an additional 10-12 minutes until filling is bubbly and crumb topping is lightly golden. I tried to leave them in as long as possible without having the wrappers burn. Allow to cool in the pan for about 5-10 minutes, then remove to a rack to finish cooling. Serve slightly warm or cool. They're good both ways. 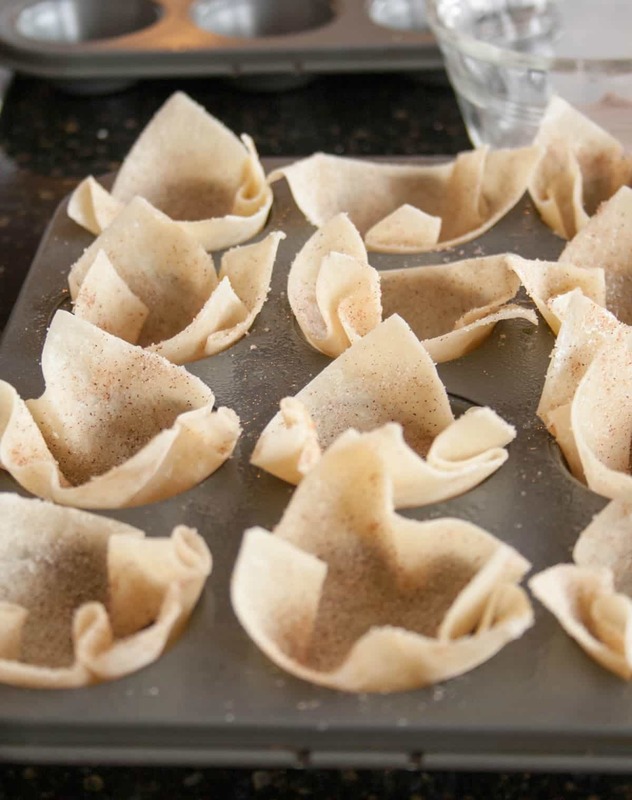 Place a wonton wrapper so that the corners are facing up/down and left/right in a diamond shape. 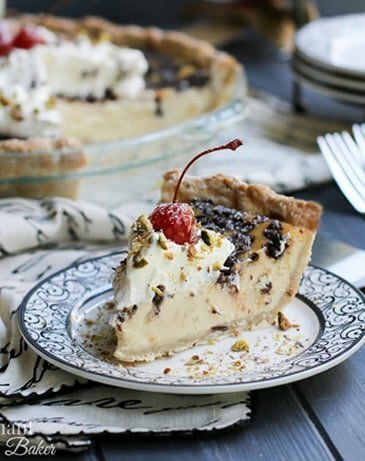 Place a teaspoon of filling in the center of the wrapper. Wet the upper left and right edges of the wrapper with a little bit of water. I did this by dipping my finger in a small bowl of water and "painting" it lightly on the edges. Bring the bottom corner up to meet the top corner and press firmly to seal. 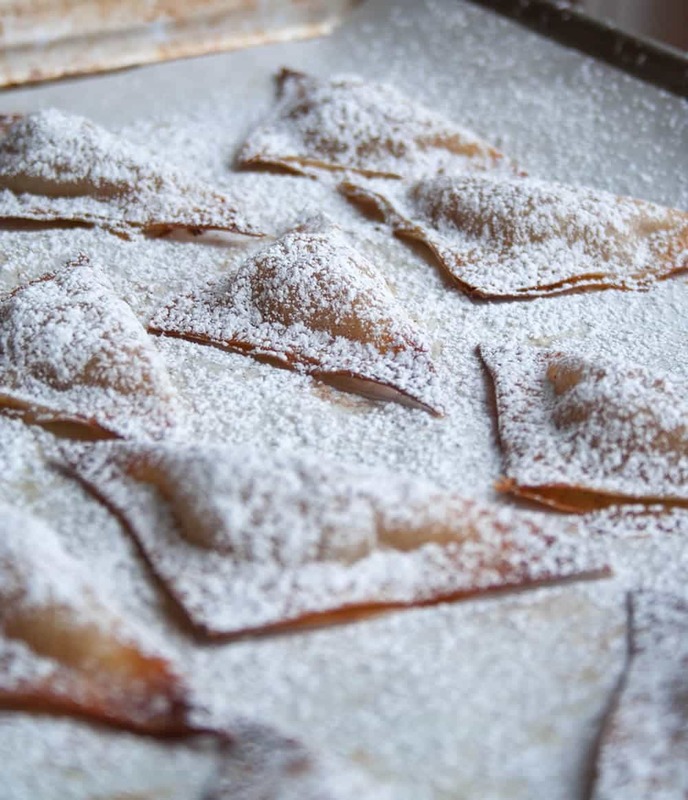 Place turnovers on prepared baking sheet, give them a light spray with cooking spray, then sprinkle with cinnamon sugar. Bake at 350 degrees F. about 10-15 minutes or until golden on the edges. Let cool for a few minutes then generously sprinkle with confectioner's sugar. *Both are best eaten the day they are made. The skins will lose their crispness on day 2 but can be reheated in a 350 degree oven or toaster oven to crisp them back up. *Either salted or unsalted butter is fine. 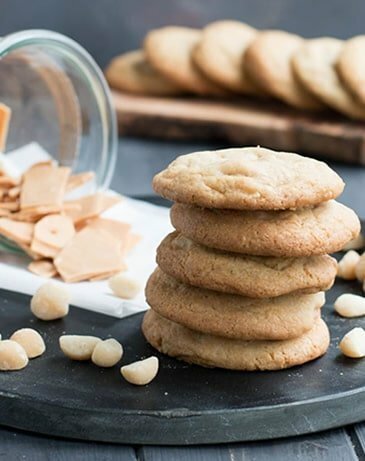 If you use unsalted butter in any part of this recipe, add a pinch of salt to it. *I used Granny Smith Apples. If you use a sweeter apple, you could use less sugar in the filling. Just start with less, taste, and add more until you've achieved the sweetness level you like. 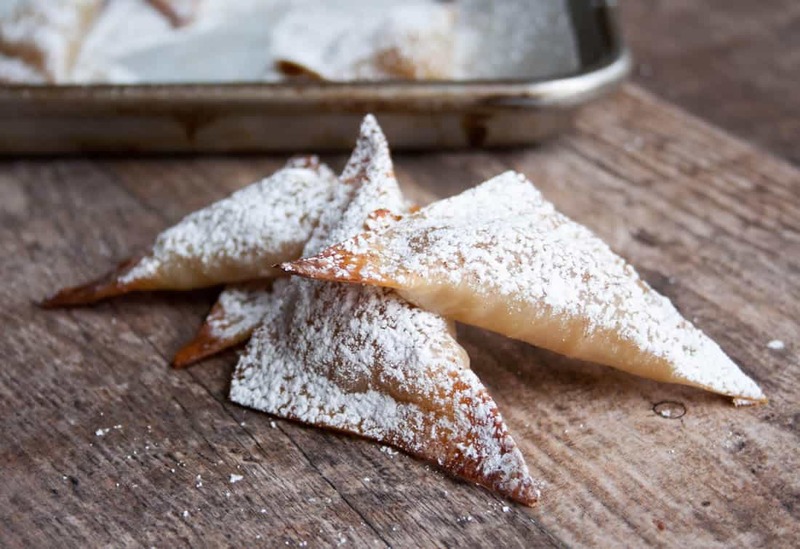 *I originally brushed the mini turnovers with melted butter, but they baked up too greasy. The cooking spray allows you to lightly oil them and helps the cinnamon sugar topping adhere. You could also try the cooking spray technique with the cups, although I didn't test it out. I did want the flavor of buttery cinnamon sugar to come through on the crust. 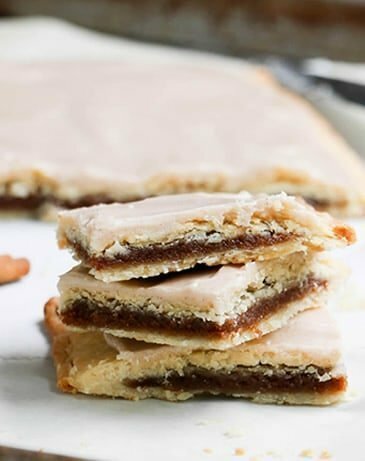 *This recipe makes about 20 cups OR 40 turnovers OR 12 cups and 16 turnovers (which is what I made.) If you do the combo, you'll only need 1 Tablespoon of melted butter for brushing since you'll only need enough for 12 cups. Also, if you only make 12 cups, you only need half of the crumb topping. Crumb topping is the best!! 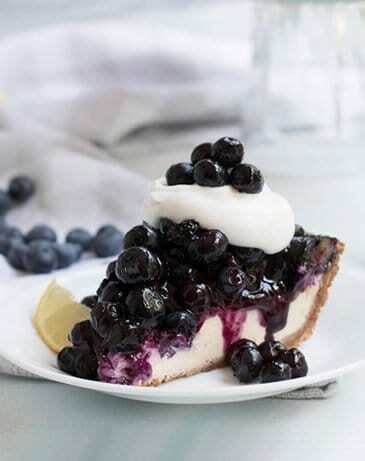 I love these pies so much! Pinned! Thanks Dorothy! 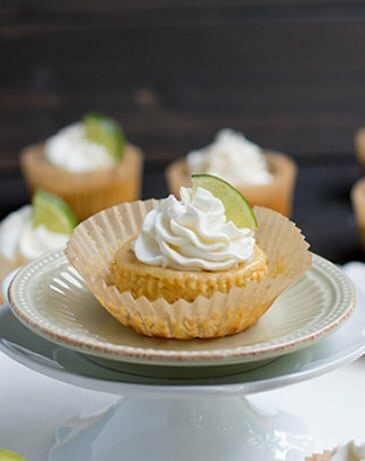 The crumb topping makes these little pies taste like a splurge! Thanks, Jenny! Both good…but we do have a favorite! What a great idea! I can’t believe these are so low calories! No matter what, I always need dessert! They’re fun for a guilt free treat! My family really enjoyed them! All I can say is WOW! 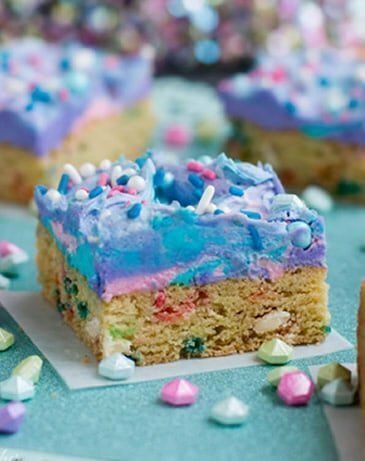 This recipe looks 100% amazing, I want to start making it immediately. 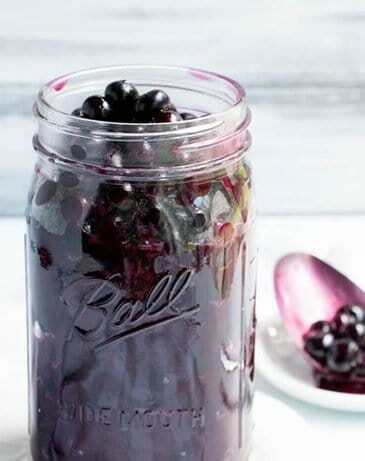 Low cal makes this a must have. Thanks Jared…I love a sweet treat that doesn’t break the calorie bank! I’m in love with this idea! Looks delicious! Looking forward to trying them. Pretty decent bang for the calorie buck!